A Christmas Carol – Charles Dickens’ classic tale will be read with key questions, ideas and attitudes explored. Poems from Other Cultures – We aim to ensure students are confident with a broad selection of poems by different poets. Short Films – students will look at a few short films and study the structure and techniques used. Autobiography – Non-fiction is an important element of the English curriculum and students will have a chance to read different styles of autobiographies. This will include letters, diaries, blogs and vlogs. There will be many opportunities to write their own biographies and autobiographies. Romeo and Juliet – Shakespeare is an integral part of the English Curriculum and we begin with the Bard’s eponymous love story. We encourage a lot of risk in exploring the language, the setting and the interaction of the different characters. Students will get a chance to look at the many adaptations of the play. 19th Century Fiction – Short stories, long poems and extracts will be covered in this unit of work, including The Raven, Tell-Tale Heart, Frankenstein and Dracula. Assessment is throughout each unit of work, with homework tasks, online assessments, research tasks and extended reading analysis and writing in class. There is a formal assessment at the end of each term. In total, there will be 3 formal assessments. Each assessment will combine the two previous units of work. Each unit of work has both a reading and writing focus, reflecting the Assessment Objectives at GCSE. Of Mice and Men – John Steinbeck’s classic novel looks at racism, sexism, friendship and loneliness. Students will explore the themes, characters, setting, ideas and attitudes in the novel. War Poetry – students will study the poets of the past three centuries who write about their experiences and thoughts on war. Many of the poems are written about and during the First World War, but we look to modern poets and modern ideas about conflict. Documentaries – students will watch a range of documentaries, deconstructing key ideas and examine features used by film-makers. Touching the Void – students will begin with extracts from this classic adventure of perseverance, courage and resilience. In addition to Joe Simpson’s autobiography, students will explore other examples of non-fiction writing. The Tempest – students will look at Shakespeare’s drama with a particular focus on the use of language and how power is presented in the play. The Woman in Black – students will study this relatively modern novel reminiscent of a 19th century ghost story. It is an excellent novel to explore structure and language, and will be used as a stimulus for their own writing. To Kill a Mockingbird – students will explore the themes, characters, setting, ideas and attitudes in the novel, and link with ideas from other novels and their own experiences and thoughts. The poetry of Robert Browning – students will explore the connection these texts have. The unit is designed to stretch students and prepare them for the requirements of GCSE. Introduction to Media – At this time of the year students have to consider their subject options for GCSE. 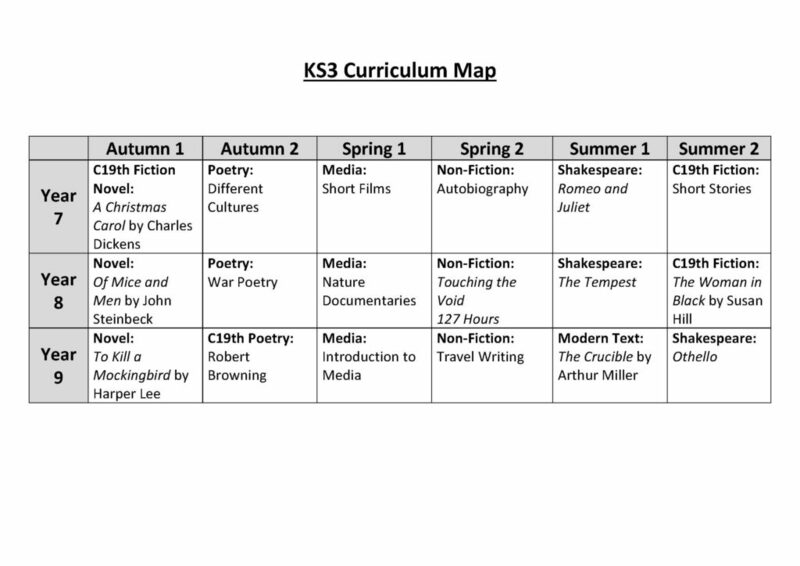 Media is a subject we offer, and this unit of work gives students a taster of the many things they could expect at GCSE. Travel Writing – students will review a number of types of writing through the medium of travel. This will include blogs, fictionalised accounts, letters, diary entries, biographies and autobiographies, brochures and magazine. The Crucible – this tragic tale, loosely based on real events, explores a variety of different themes and provides students with many different and interesting characters. Ostensibly, students review the multiple sides of good and bad. Othello – Another of Shakespeare’s tragedies is explored, where students will focus specifically on the reasons for Othello’s downfall and the implications of his betrayal.